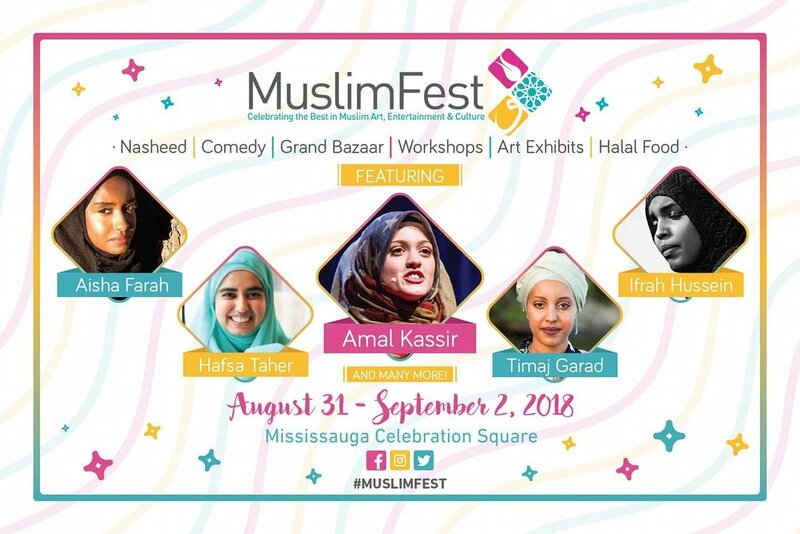 A weekend of love, laughter, food and entertainment for people of all ages is just around the corner with the annual MuslimFest celebration happening in just a few short weeks. The 15th annual MuslimFest (MFEST) returns to Celebration Square in Mississauga from August 31 - September 2. The event, which does not charge admission and runs from noon -11p.m. each day, will feature live performances, art exhibits and delicious food vendors. The festival is a unique cultural fusion that combines faith traditions and Canadian culture. The festival will begin at 5 p.m. on Friday, August 31 with the 2nd annual Flag Unveiling Ceremony and a children’s choir singing the national anthem. The festival stages will be busy with a full line-up of entertainers scheduled for the event. Timaj Garad will present her poetry and spoken word pieces. Dawud Wharnsby and Harris J. will entertain festival guests with their musical performances. Comedians Mark Strong, Jeremy McLellan and Azhar Usman will keep guests laughing on Saturdaynight. Those attending the event will have the chance to browse and shop at many unique vendors over the weekend. There will be a Fragrant Oils Boutique and vendors selling Turkish clothing, Middle Eastern ornaments, Turkish lights, and more. Taste buds will be delighted by the food offerings at MuslimFest. Yemeni Food by Monasabah, Watan Kabob, Hailed Coffee, Ishtar Iraqi Foods and Dimkin Crepes are jut a few of the vendors who will be present throughout the weekend. On Saturday and Sunday, festival attendees can learn how to create paper flowers with Hafsa Creates, draw comics or write Arabic calligraphy. Registration for workshops is based on a first-come-first-served basis. In addition to the workshops, there will be an arts and crafts tent and carnival games where children and families can drop by throughout the day. A wide array of artwork from artists of all backgrounds will be displayed over the course of the festival. Some of the artists being featured are: Artistically by Iram Abid, Bana's Islamic & Arabic Ceramic Fine Art, The Floral Art Project, and Art by Syeda. To learn more about the event, visit muslimfest.com, follow on Twitter, Instagram, like on Facebook and check out past festival pictures on Flickr. To stay up-to-date, use and follow the hashtags#MuslimFest, #MFEST2K18, #WasteFreeMuslims. MFEST is an award-winning annual festival in Mississauga that celebrates the best in Muslim arts and entertainment. The event is put together by 200 volunteers with the aim to display art and performances to enlighten and share a unique cultural experience for all. Launched in 2004, MuslimFest is a joint project of DawaNet and Sound Vision. Today, it is considered North America’s largest Muslim festival of its kind, attracting over 40,000 attendees annually. MuslimFest is one of Ontario's top 100 festivals and is listed among Top 40 Best festivals in North America by FlightNetwork.com. MuslimFest was recognized by City of Mississauga for their #WasteFreeMuslimFest campaign. In 2017, they diverted tonnes of garbage away from landfill by recycling and separating compostable waste at the Waste Station thanks to the festival’s dedicated Green Team.